The tone is composed of a mixture of various octaves. You can change the number of voices (default 10), and the base pitch (octave). The latter needs to be incremented if you markedly reduce the number of voices. 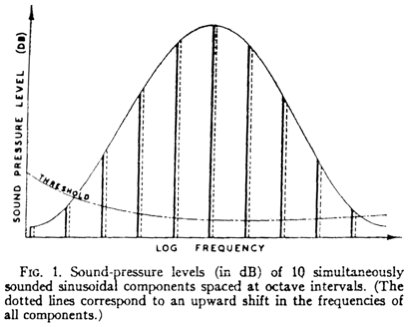 Roger Shepard invented this acoustic illusion in 1964. His basic idea was as follows: When the pitch rises one step, the harmonic composition is altered (a little less high, a little more low harmonics). This is done in such a way that after 11 steps the harmonic content corresponds nearly to a tone one octave lower. With the next step the sequence resorts to the first one (the note ‘A’). In Hofstaedter’s Gödel, Escher, Bach there’s also a nice explanation. In his 1964-article Shepard himself likened this to Escher’s ever-rising staircase. In fact, the icon on top right is lifted from Shepard’s paper. Roger Shepard (1964) Circularity in Judgements of Relative Pitch. Journal of the Acoustical Society of America 36 (12): 2346–2353. doi: 10.1121/1.1919362 (paywall).